In e-commerce, a huge portion of your sales come during Q4. It can be a great time of year, but it can also be hell if things break in your business. One or two small problems can kill your revenue for the quarter and leave you waiting for next year to recover. Here’s a few things you need to anticipate. What If Your Key Employee Leaves? No matter how much you trust your team, there’s always a risk that people will not be there when you need them. While Sarah, your right hand in customer service, would never screw you and quit the day before Black Friday, she could have an emergency in the family or get hit by a bus. Regardless of what the reason is why she isn’t available, it’s your job to keep the business afloat. If this guy disappears without notice, what would I be scrambling to handle? Who else could handle that woman’s job? If they leave, what the hell am I going to do? Hopefully this doesn’t happen to you, but it happens to everyone at least once in their entrepreneurial career. You don’t need to map out your entire business and every single button your team presses. But having basic documentation of how key things in the business are handled is important. For example, if a return needs to be processed, how is that decision made? Once a return is approved, what are the logistics of making it happen in a great way for the customer? While someone specific on your team might handle these things right now, it’s important to have a basic checklist of what is being done in case someone else needs to step in to the role. If you use a home grown customer service system that you or someone on your team built over time, this can become a huge hassle when you try to bring in new people. For example, if your key team member bails and you need to hire temporary help, your odd ball customer service process is going to be a nightmare to train them on. You might not be able to refine your customer service system before the holiday rush, but at least be aware in advance if that’s going to be a problem when you go to train new people. Maybe address it next year. You don’t need to hire a replacement for someone that’s reliable now, but you need to know how you would replace them quickly. For example, where would you find a replacement, what types of qualifications would help you quickly filter applicants, and what’s the maximum amount you can pay to get somebody good in a crunch? Websites like Upwork.com can be really helpful to find people quickly, but you need to know who you’re looking for and what your budget is to move fast. If you’re only offering customer service during business hours, and not on nights and weekends, this doesn’t cut it for the holidays. People use e-commerce for convenience, which during the holiday often means doing their shopping at night after the kids go to bed or on the weekend when they’re working. If you’re not available and responsive nights and weekends, your (almost) customers will just go to a competitor. This doesn’t mean you need offer 24 hour seven day per week coverage, but you do need to be available more than just 9 to 5 Monday through Friday. If you’re mainly selling to the North American market, make sure you’re available 15 hours per day, with coverage into a late evening around 11 PM. More people will be buying late at night versus early in the morning. People are often in a rush when doing holiday shopping. They are on multiple websites and just trying to crank through their shopping list while they have time. If you only offer email support, that’s not fast enough. People want responses quickly so they can finish up their order. The best option is to provide live chat at all hours, and respond to messages quickly. Visitors prefer live chat over other support channels because it’s fast and easy, and fits into their workflow while multitasking. Don’t require visitors to complete a form before they can ask their question. This just puts a wall in front of them. Make it easy to click the checkbox and ask a question. Don’t just offer a “click to chat” option. Invite people to chat based on what they’re doing on the site. This enables you to connect with people when they likely have a question and help them through the purchase process. When somebody clicks on the chat box and asks a question, you need to respond within 4 to 6 seconds. 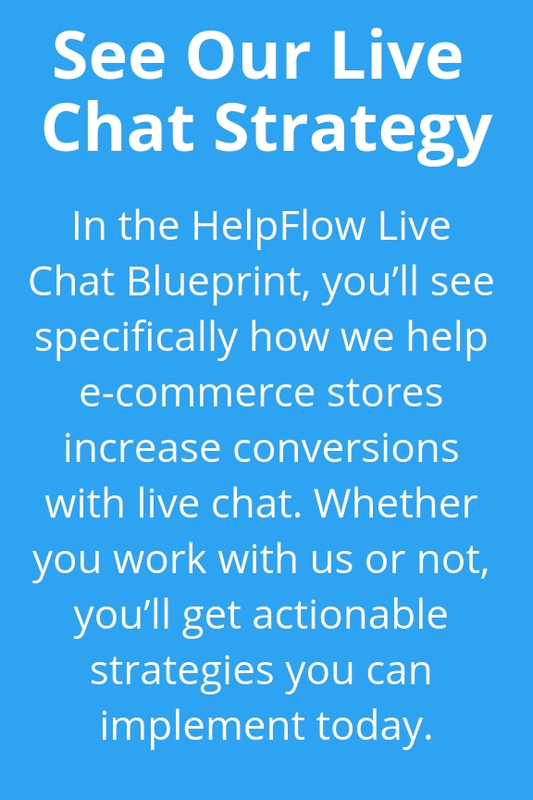 Live chat is one of the few channels that will hurt your conversion rate if you do it poorly. If you take longer than 4-6 seconds, the entire website’s conversion rate will go down. People sit there and wait for a response, they get frustrated as the seconds pass, and then they leave. We have a methodical way to learn your business. We can be up and running in 1 week! Adding HelpFlow to your website can increase conversion rates 10-30%, which is tracked directly within Google Analytics. Below is a Client of ours showing before and after results. The ONLY difference between these time periods was adding HelpFlow.